Time to meet Heidi. The tour with a human guide had sold out so Heidi was on her own with an audio guide. We kept seeing each other, even in the immense palace heaving with thousands of people. Visiting Parliament was the tourist highlight of my summer. I don’t know why I’d never been before. We weren’t allowed to take photos, which was probably good because there was so much to absorb. London is made up of inner and outer boroughs, Westminster being one of them. Westminster is also a city. Then there’s The City, which is the business hub of London, while Westminster is everything else. Westminster originally meant “that church on the west side of town” and there was also an east minster. 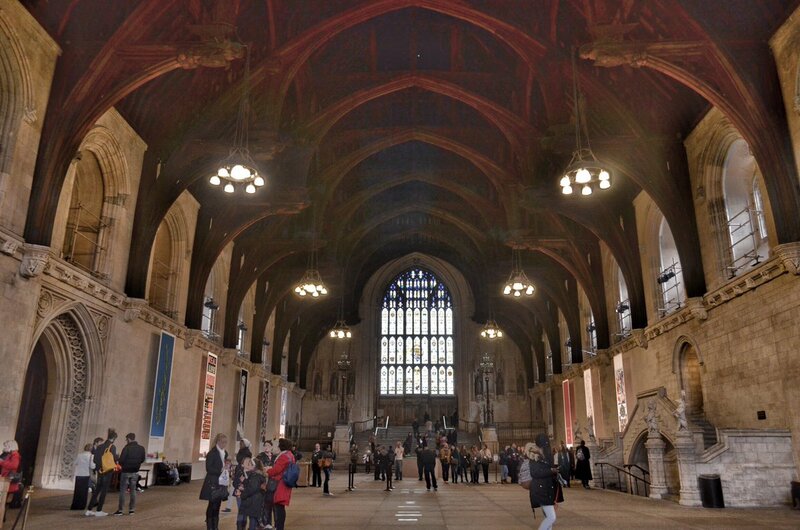 Westminster was originally built as a palace in 1016 for Canute the Great. What Americans think of when we hear Westminster—if we think anything at all—is of Big Ben and Westminster Abbey and the Houses of Parliament overlooking the Thames, and that’s all spectacular. Occasionally we’ll be treated to news clips of parliamentarians ranting at one another. Our politicians don’t yell—they smile and talk in circles and stab each other—and us— in the back. The guide for our group of 20 informed us she was a Blue Badge, which meant she knew her stuff and had undergone extensive training to present information in a clear and entertaining manner. Standing in the enormous great hall where the tour started, I had my doubts about how well I’d be able to hear her, but she projected beautifully. I won’t go into an explanation of how the UK government is organized and how it functions. I was curious to hear what she would have to say about the House of Lords and the role of the monarch. As an American, the idea of unelected representatives living lavish lifestyles is incomprehensible. We like that England has a royal family we can read about in the tabloids, but we wouldn’t put up with (and pay for) one ourselves. Fair enough. We do give extra points for name recognition. However, George W. Bush did have to run for office, and it wasn’t a foregone conclusion that he would win. His brother Jeb bombed in the last election. You know what happened to Hillary. By contrast, the queen and princes not only don’t have to run for office, they really can’t escape them unless they do something drastic like marry a divorced American commoner … oops … times have changed, that’s no longer enough to get you disqualified. The nearly 800 members of the House of Lords are appointed, and the monarchy is hereditary. Members of the House of Lords receive a £300 per day attendance allowance. They get this whether they spend 10 minutes in the chambers or 10 hours, is my understanding. This feels outrageous to me, but I guess if UK tax payers are okay with it, it’s not my problem. The 650 members of the House of Commons, who have to run for office, earn a basic salary of £74,000 plus supplements based on their role, ranging from £15,025 to £74,990 (for the Prime Minister). This is does not seem out of line to me, given that London is one of the most expensive cities on earth. Our guide posited that their unelected branches of government are a strength because they aren’t constantly thinking about the next election and what moves they should take to look good to the electorate. The monarchy and House of Lords balance the constantly-changing winds of politics with continuity and stability. Speaking of divisions, the guide spoke about the “division bells” which are set in pubs around Parliament. When they ring, MPs have eight minutes to run back to Westminster for a vote. 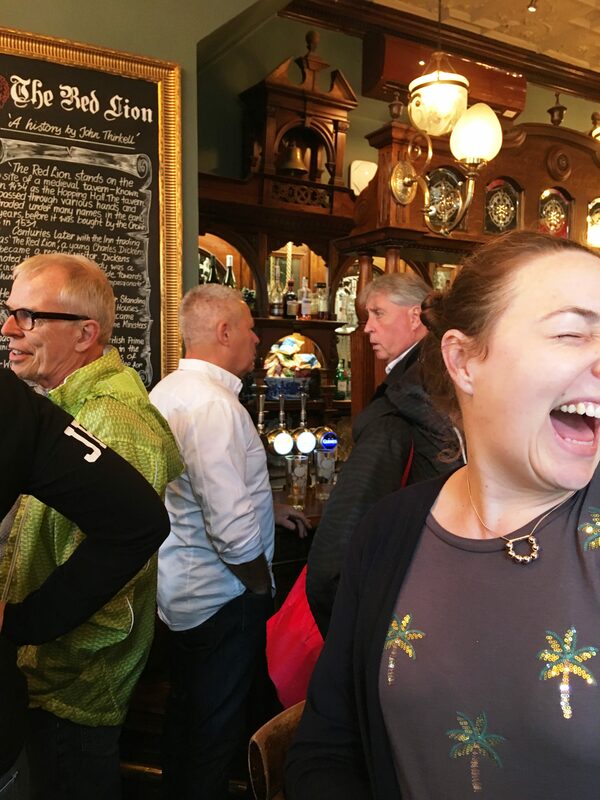 Heidi and I, being great students of history, took it upon ourselves to conduct further research on Parliament in the Red Lion. We didn’t hear the bell ring but we had a smashing time while planning our next move. This entry was posted in Adventure, Budget travel, Culture shock, Living abroad, Travel and tagged Houses of Parliament, London, UK Government, Westminster on January 5, 2018 by Breaking Free.